The latest addition to every woman’s skincare routine is night creams. They are on the rounds in the market, and very good night creams are available in India quite easily (and at a very reasonable price). The newest addition of night skincare routine is not all that new, though. 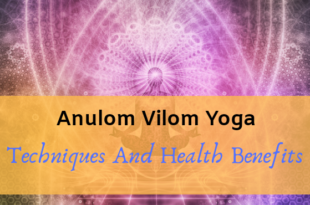 However, it can be said that the commercial availability of night creams at our disposal has become popular over the past few years in India. Why use a night cream? The claim is that, after the day’s tiring work pressure (or any other stressful chore, you name it! ), the harsh sun, pollution and what not in our streets! 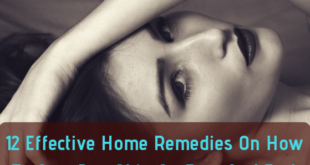 The skin builds itself and rejuvenates at night, to heal and better itself from these harmful effects. Technically, the meaning behind ‘beauty sleep’ is this. 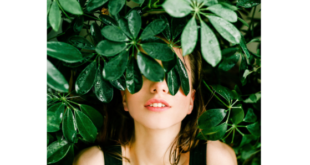 The skin has been designed naturally to work from the inside out during your night sleep; not just relax from it, rather it benefits a lot from the perspective of skin health wise! Therefore, when you use a night cream on your cleansed skin before you hit the bed, you pump in extra care to wake up to an extra healthy and glowing skin! Although few believe that a day cream is as good as a night cream; as far as the composition and ingredients are concerned, a night cream is specially formulated to nourish the skin overnight. 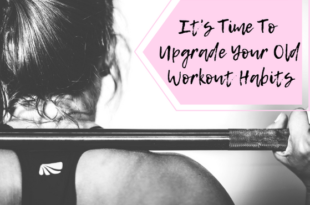 The choice is completely yours! 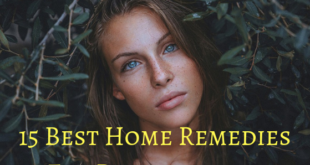 If you are a considerate skin care fan, and you are on the lookout for the perfect night skincare routine, then this is for you! Yet another product with all the goodness of nature. Himalaya again does not promise any great wonders, rather it is true to its name and does just that. The mild cream that blends so easily into your skin is non-greasy and light to use. Doesn’t leave the face oily, it is very affordable too. A simple skin care routine is always the best. If that is on your mind, Himalaya Revitalizing Night Cream is the one for you. Click the button, to purchase this product. 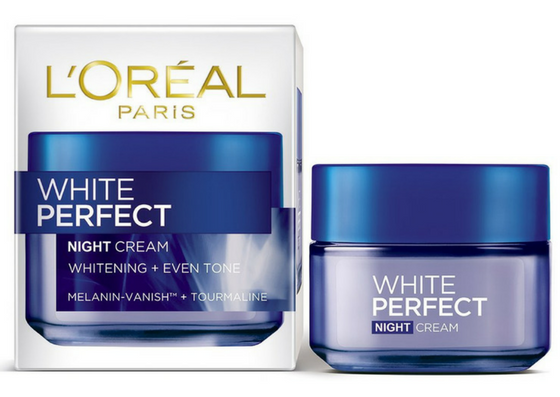 Get lighter skin with L’oreal White Perfect Fairness Revealing Soothing Night Cream. This could be your answer to find a night cream that works on small pimples, hyperpigmentation, dark spots, age spots and dull skin. The product is light, lotion-like and spreads easily. 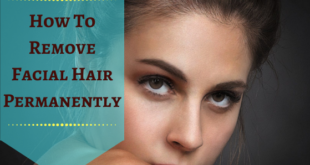 It definitely makes the skin brighter, radiant and lighter toned. However, one aspect to be careful about could be to do a patch test before you use regularly. If it suits your skin type, this is a good night cream to take to. Sounds like this one is your pick? You can purchase this night cream from here. Age miracle and overnight repair are what this product from Pond’s promises to its customers. And it keeps up to its word. Even if not a miraculous one night change, with regular use this night cream works effectively on your facial skin. The fruity smell and medium textured cream delivers the results you expect. 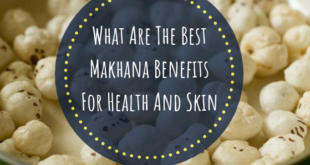 Loads of antioxidants and AHAs works on skin to even out the tone and make it improve considerably great. 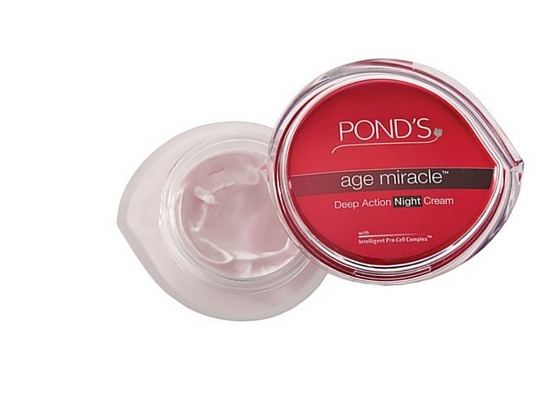 If anti-aging is your focus, the Pond’s Age Miracle Deep Action Night Cream is a good hope. Press the button to purchase this product. 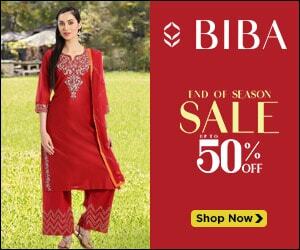 The different range of products from Olay and the alluring names are a definite attraction. As long as the claims are met, we women don’t mind, do we? 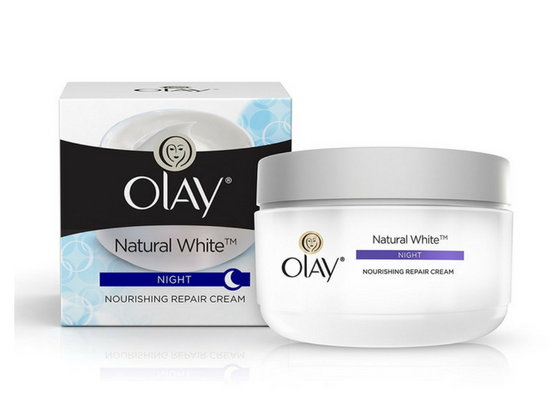 The same applies to the Olay Natural White Night Cream. As the name says, there is a significant improvement in skin tone over time. The glow that the skin gets overnight is brilliant too. The cream is silky and mild, foamy in texture just like whipped cream. The pleasant soothing fragrance is relaxing. A small massage into your cleansed face before bed with this cream does the magic. If a beautiful supple skin is your idea, you can give this a try to achieve that bright dewy skin. The Lotus brand is also yet another faithful fanatic of natural elements into their product. Just like any other Lotus product, this night cream is also mild to touch and delicate on the skin. 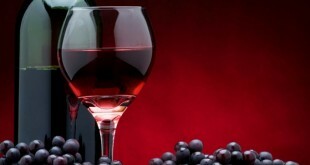 The fruity scent (of grapes and berries) is pleasing and lingers on the skin for quite a long while. The cream lives up to the claims replenishing the skin. The texture of this night cream is foamy and soft. 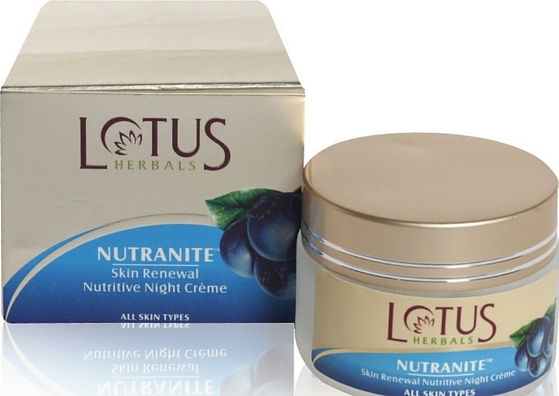 For a simple and effective night cream with nutrient benefits, Lotus Herbal Nutranite Skin Renewal Nutritive Night Cream is certainly a good pick. 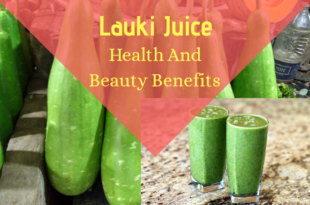 Lakme also comes out with a wide range of products, and this is one among them! If not a wonder-worker, it is pretty good for a radiance and skin whitening. 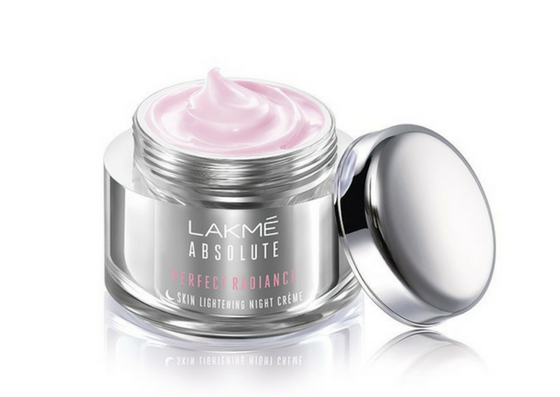 A slightly thick cream with a pink pleasant colour and smell, Lakme Absolute Perfect Radiance Skin Lightening Night Creme does work quite effectively. It is also priced reasonably and lasts long for use. The consistency makes it not appropriate for all skin types, but it is a definite good try to get the radiance you want to wake up to. Radiant glowing skin is yours every morning view with Lakme Perfect Radiance Skin Lightening Night Creme. If you are looking for a highly potent and skin friendly night cream that does minimal work then you should try VLCC Snigdha Skin Whitening Night Cream. 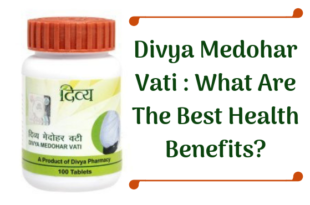 It comes in a sturdy white tub packing and has enough quantity for a decent price. The cream is almost lotion like in consistency, spreads effortlessly into skin, has a mild fragrance and does not cause breakouts (even on sensitive skin). However, this product might not satisfy you if you are looking for only fairness and whitening. 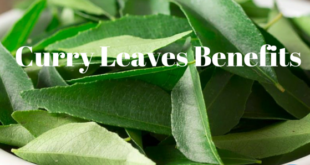 The cream leaves skin hydrated, supple and moist from the very next day of using it. It definitely makes skin brighter and clearer from before but does not change complexion as such. 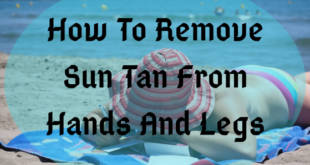 It works on tan removal to an extent which is almost one step closer to becoming fairer. Except for this claim not meant otherwise, this is a good night cream to fall back on. 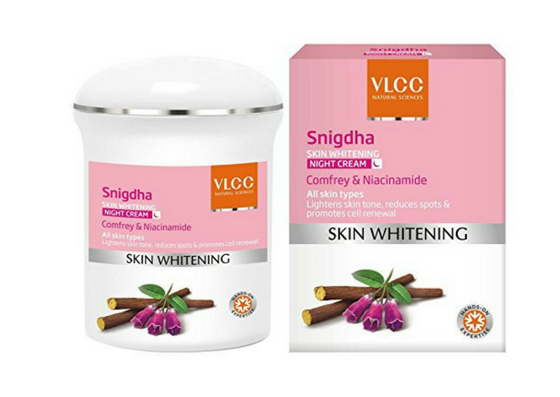 Tan removal and healthier skin is yours with VLCC Snigdha Skin Whitening Night Cream. A decent product at a great price could be this one. 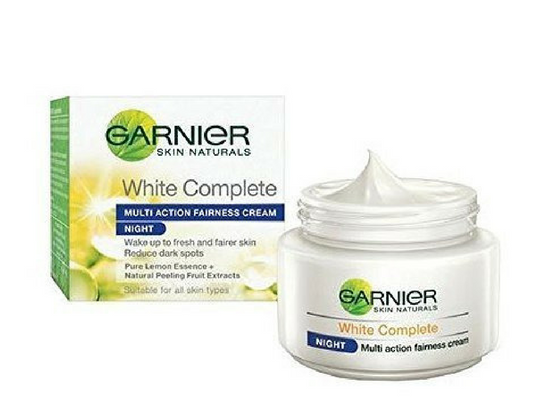 Most customers find that the Garnier Skin Naturals White Complete Multi Action Fairness Night Cream is much better than the day cream. The best about this product could be the wonderful mild scent that most Garnier products have. It is white, lotion like inconsistency that seems to get greasy during application, but doesn’t. A mild massage helps skin to absorb the cream within and impart a mild glow immediately. It does tend to get a bit oily but most night creams do that; which can be attributed to their rich moisturizing components. The skin is visibly brighter, smoother, and softer in the mornings. 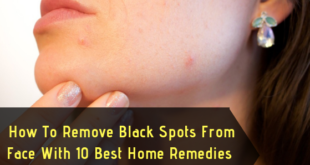 Regular use has proven results to fade away dark spots, blemishes, and even acne scars. However, ‘whitening’ is definitely a misleading claim. The natural fruit peeling extracts work on tan removal and make skin bright but does not impart fairness exactly. This could be a great pick if you want a simple night cream on a budget. Glowing skin is yours with Garnier Skin Naturals White Complete Multi Action Fairness Night Cream. 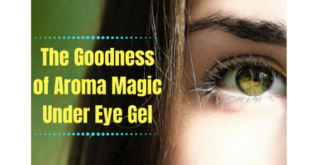 If you are consciously on the lookout for the specific action of Vitamin E for your skin, you should try Aroma Magic Vitamin E night cream. 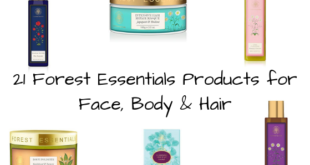 It combines the goodness of Vitamin E and essential oils for your skin. They work on renewing and rejuvenating skin cells to give you glowing and smoother skin. The cream works well to give you plumped skin that is brighter and fresh in the morning. 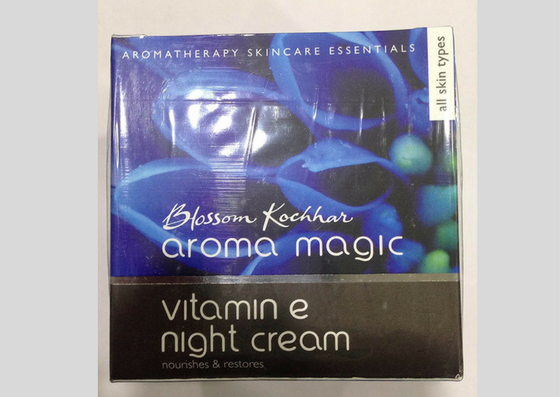 A simple night cream with oil-rich formulation is yours in Aroma Magic Vitamin E night cream. 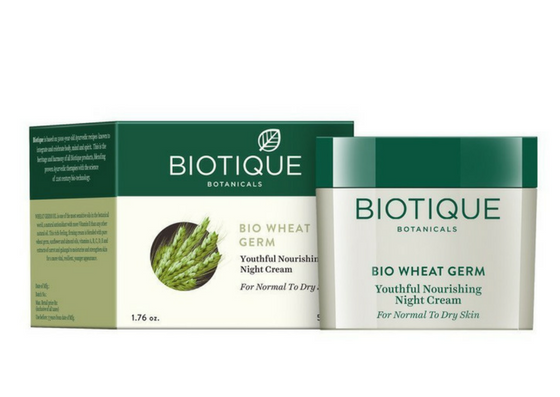 A complete wrap of all natural botanical extracts in one tub- Biotique Bio Wheat Germ Youthful Nourishing Night Cream. 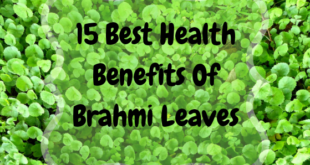 It comes in a sturdy tub packing that is typical of Biotique products. The best part about this night cream is that it contains botanical extracts and is ayurvedic. It has pure wheat germ, sun flower and almond oils, Vitamin A, B, C, D and E, and the natural extracts of carrot and galangal. The consistency is thick and almost sticky. It moisturises and nourishes the skin, keeping it healthy and supple. But does nothing more; if brightened skin or fresh skin or other help to handle problematic skin is your expectation, you will be disappointed. 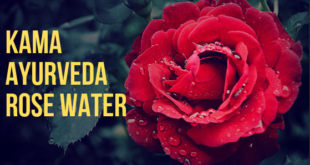 It does leave the skin feeling oily or dull in some oily skinned people. If your skin type likes the nourishment that this night cream gives, maybe this one is for you. If a night cream to help battle the tiring day and help skin in its night regime is your goal, this could be it. The top 10 night creams in India are the above. Hope you found the list and review useful. Never forget, your skin is unique and so special that it functions in its own way. If you are aware of any adverse skin needs to be met, it is advised to consult with a dermatologist. But if your skin adapts to topical beauty creams, try the best one that suits you from the above! Stay beautiful, inside out. If you have tried out any of the night creams from above, or if you have any better suggestions, let us know in the comments below.